Did you know that even a small faucet leak could be wasting hundreds of gallons of water in as little as a year? That is precisely why it is so important to ensure that your facets are in in good working order. While most faucets will last a decade or more depending on various factors, here are six signs your faucet may be in need of repair. If you notice that your faucets are dripping, this is a sign that you either have high water pressure in your pipes or malfunctioning valves, and therefore troubles with the plumbing. Either way, this is a sign that you should contact a plumber. Similarly, if you notice water damage either at the bottom of the faucet or underneath the sink, this is also a sign that your faucet needs to be repaired. Perhaps the handle doesn’t work anymore. This may be a sign that you need to replace your faucet entirely. If your faucet fails to produce a nice stream of water, the problem likely comes down to a clogged aerator, the screen that covers the tip of the faucet. Faucets can produce a variety of different sounds, depending on the problem at hand. In the event that you notice any type of sound, it is a sign that you either need to do a bit of maintenance or it is a more serious problem. If you hear a screeching sound, you likely need to replace a worn rubber washer that has hardened over time. If you hear other sounds, such as a clanking or a clicking, this is a more difficult problem to solve, especially if the sound is coming from the faucet and not the pipes. It will require taking the faucet apart and inspecting for any potential cracks in the pieces. Rust and mineral deposits are two of the most common types of faucet damage. If you notice either of these on the surface of your faucets, it is time to repair or replace your faucet. Mineral deposits, in particular, can cause further damage depending upon the type of water that is entering your home. Rust and hard water can be taken care of with vinegar and lemon juice. If the handle on your bathroom sink makes a squeaking sound, this is a sign that the faucet stem has been worn down. To repair this, you can take some plumber’s grease and coat the handle stem once you take apart the faucet. 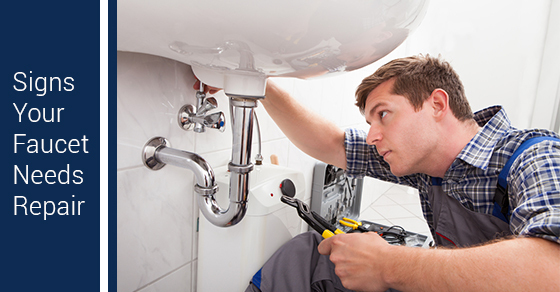 If you suspect your facet is in disrepair, contact our team of plumbing experts at Brothers Plumbing today. We have over 50 years in the business and a superior track record in the industry. We offer competitive rates, upfront quotes and 7-7-7 service.